JoomiWeb is not a virtual assistant you should trust. According to our malware researchers, this ad-supported program is more likely to present misleading advertisements than original deals, coupons, or discounts. Even though the promotion on joomiweb.com suggests that this program is helpful when shopping online, our researchers can assure you that there is only one thing you need to do about this adware: Remove JoomiWeb. Read this report to learn more about this program, follow the manual removal guide, and use the comment section to ask questions. The developer of JoomiWeb is SuperWeb LLC, but the distributor of this ad-supported program is unknown. In fact, many different parties can be involved with the distribution of this infection, and they might use different tactics to attract you. It is most likely that you will be introduced to the installer JoomiWeb when you click unreliable download buttons on malicious websites. Needless to say, if you do not want to have to delete JoomiWeb, you should not install it in the first place. 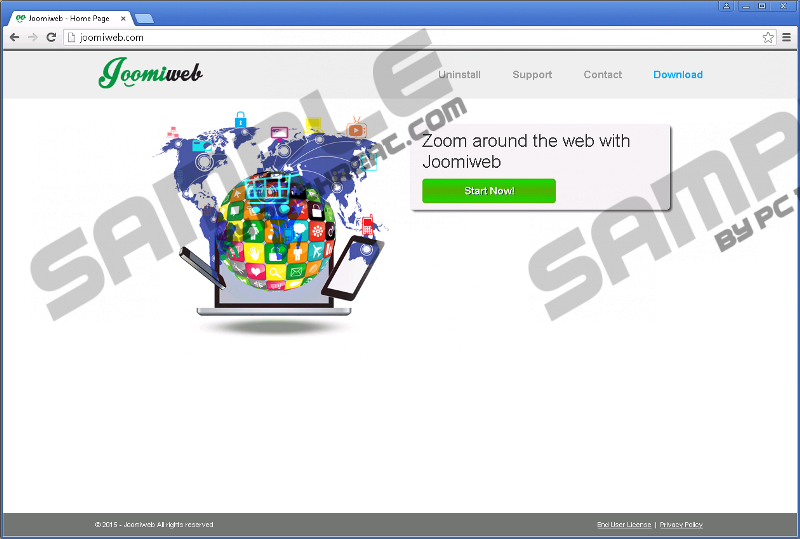 It is most likely that you have not researched JoomiWeb before installing it onto your PC. If you had researched it, you would know that this adware can inject unreliable ads. These ads can be targeted directly at you using the browsing history that is collected by tracking cookies. The same tactics are used by other ad-supported programs created by SuperWeb, including Intense Results, Screen Flip, and Internet Blast. Even though it is unlikely that you will need to delete these programs along with JoomiWeb, their removal is important. If you have installed JoomiWeb recently, it is most likely that you will be able to delete this ad-supported program without encountering security threats. But if this infection was installed awhile ago, you might need to remove tracking cookies and other infections introduced via JoomiWeb ads. Unfortunately, you might have to delete malicious programs even if you rush the removal of JoomiWeb. As mentioned previously, this adware can come bundled with malware, and you must NOT forget about it. You need to look at the bigger picture when removing JoomiWeb. As you now know, you might have to delete a few other threats along with this unreliable ad-supported program. If you cannot perform the removal of this malware manually, there is no need for you to delete JoomiWeb yourself. Install an automatic malware remover and let it delete all computer infections that were installed onto your PC. Move the cursor to the bottom of the screen and click Start. Move to Change or Remove Programs, select JoomiWeb, and click Remove. Click the Windows icon on the left of the Taskbar and click Control Panel. Move to Programs/Programs and Features and click Uninstall a program. Go to Uninstall a program and right-click the program you want to delete. Click Uninstall to delete this unreliable program. Quick & tested solution for JoomiWeb removal.